Dr John Clague was a collector of music, song, calendar customs, Manx Gaelic proverbs and folk medicine remedies and charms. With fellow collectors, WH and JF Gill, he published Manx National Songs in 1896 and Manx National Music in 1898. His original music notebooks dating from the 1890s were donated to the Manx Museum (Manx National Heritage). They contain 315 melodies. 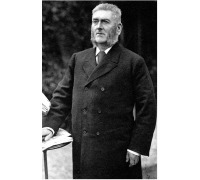 His bi-lingual book (Manx and English) Cooinaghtyn Manninagh: Manx Reminiscences was published posthumously in 1911. Clague attended Ballabeg Village School (Arbory), Castletown Grammar School and King William’s College. He worked on the family farm at Ballanorris for a few years before going to London to study medicine at Guy’s Hospital. He worked as a doctor in the parishes of Santon, Rushen, Arbory and Malew and was Surgeon to the Household of the Governor from 1888-1901. Clague was a keen amateur violin player and formed the Castletown String Band. He composed the well-known hymn, Crofton, named after his house in Castletown. He was a founding member of the Manx Language Society (formed in 1899). Why was he interested in Manx culture? Dr Clague was aware that the use of Manx Gaelic was in rapid decline along with the old songs, customs and sayings. He endeavoured to collect and preserve as much of the ‘oral tradition’ as possible before it was too late. How did he go about it? Dr Clague used his position as a well-respected doctor to collect songs and melodies in the towns and the countryside in the south of the Isle of Man. Most of his informants were men and they came from different working backgrounds: they included a quarryman, surveyor of roads, parish clerk and a painter. His most well-known informants were a blind singer called Tom Kermode - nicknamed ‘Bwoie Doal’ (Blind boy) who was a fisherman from Bradda - and his coachman Charles Clague who played the fiddle (violin). As a trained musician, Dr Clague could accurately write down the melodies as he collected them. Music from his collection was arranged and published in Manx National Songs in 1896 and Manx National Music in 1898. His original collection of notebooks was re-discovered in the 1970s and published in the Kiaull yn Theay books. A tower was added to Arbory Church in 1915 in memory of Dr Clague and he featured in the New Manx Worthies book and on an IOM Post stamp to celebrate the IOM's year of music (1985).